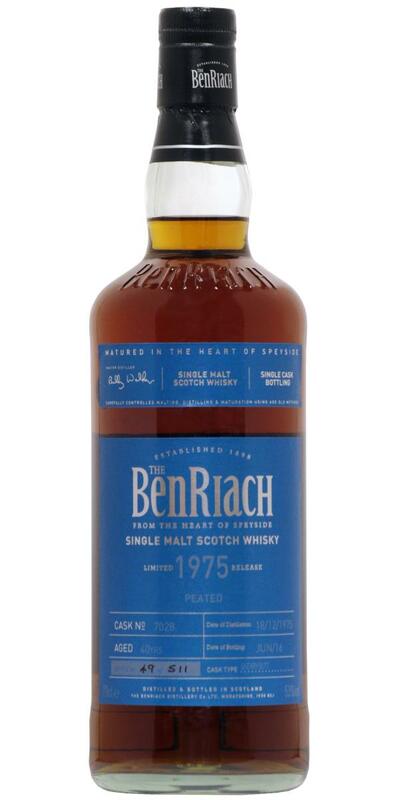 Perfect example of BenRiach spirit in a good quality cask. Tropical fruits of pineapples, papaya and passion fruit with slices of tinned peaches in syrup. Sherry begins to creep in, so elegant and refined with classic notes of fine aged sherry and port and some liqueur like qualities. With time the cask adds depth with notes of caramel with a salted touch, saltwater toffees. Delicate arrival with red berries and brambles followed by a soft and warming clove and cinnamon spice. Oak notes begin to rise but the juiciness of the spirit keeps it balanced and in check. Soft smoke and sweet oak, honeyed BBQ, maple syrup on babyback ribs. Wow, what a dram. It needs some time, perhaps 15min or so! It's worth! surprisingly fruity, tropical fruits coming up, especially mango and peaches. Slightly spicy, cinnamon, nutmeg, cant' hardly decect any smoke, perhaps a hint. Immediately present, mouth coating, and again the mango and the peaches, the cinnamon again, and very fruity indeed, with a hint of oak and smoke. Quite long, once more the fruityness and a little smoke. N: Being such a dynamic shape-shifter of a nose, it’s almost futile to try and list such temporal descriptors as a road map. Of those I noted included mineral-y Worcester sauce, white putty, egg yoke, burned caramel~coffee sugars and dry bacon. 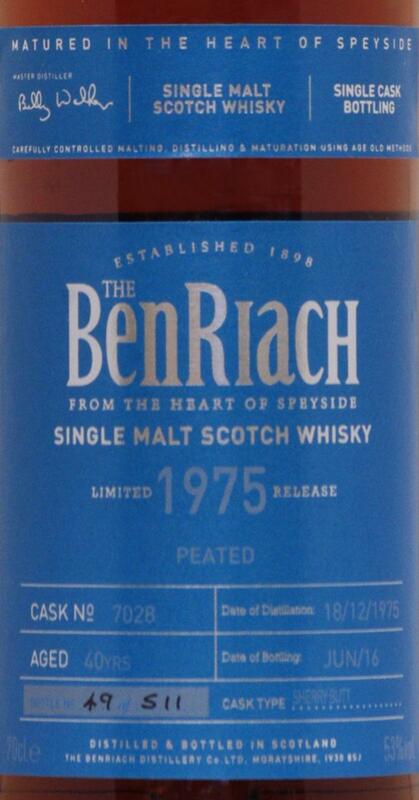 What’s sure is the peat is truly consolidated which suggests yet another great oldie/40yo. This is truly a fabulous tasting that I wish had no end. T: Old sherried & consolidated all-sorts, the ppm fabulously understated alongside the bourbon-y, peaty, mineral-y and dusty dry meat notes. F: Mineral=peated sherry>bourbon [illusion? ], with aniseed and a plethora of fruit-sweet cough drops. Rallies at the end. C: Really deserves much more time. Lowered to 49% with water: Softer and more harmonious and a little more fruity than before. The burning on the tongue has also disappeared. Otherwise he has not changed much. A nice drop, the peated 84er from the sherry keg, which were bottled between 2012 and 2014, but I liked better. They are less dominated by sherry and have stronger peat smoke with notes of roasted hazelnuts. Dry sherry combines with sweet malt, raisins and oak. The peat smoke comes through again and again, but disappears again quickly. It is better to sniff the smoke directly at the bottle. In the background you can still discover a bit of glue. Overall, a bit closed, may need a few drops of water. Moderate to full body with dry sherry, roasted nuts, plenty of oriental spices, an extra dose of black pepper, dark chocolate, mocha, caramel, leather and plum compote - pervaded by the smoke of an extinct campfire. The wood from the barrel is well integrated. The ABV of 53% I feel as too dominant and produces a slight burning sensation on the tongue, which is a bit annoying. Long - with dry sherry, spices, raisins, bananas, removed occasionally a little licorice. Nose: Bursting with tropical fruits and ripe banana with the most distant hint of campfire embers. characters add a classic aged depth.